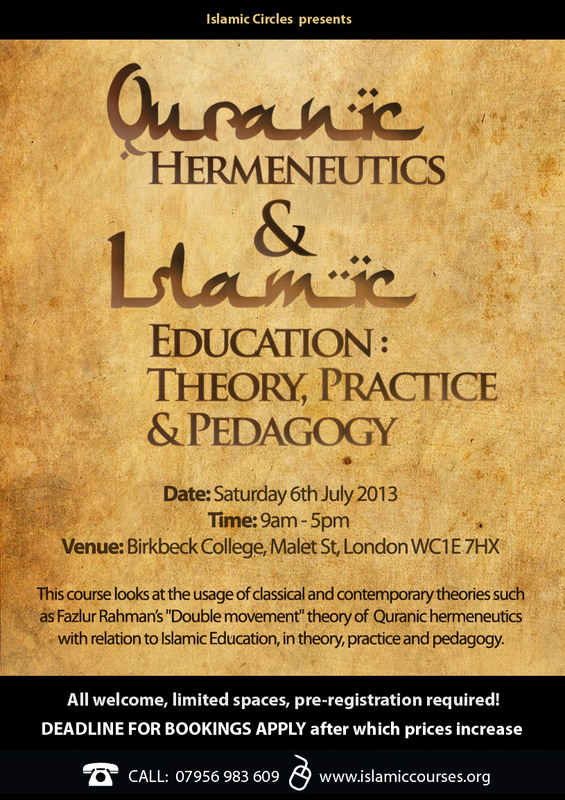 This seminar looks at the usage of classical, and contemporary theories of Quranic hermeneutics with relation to , Islamic Education in theory, practice and pedagogy. It will draw on a number of classical commentaries such as the work by Imam Tabari, Zamakhshari, Qortubi and Ibn Taymiyya as well as specialist Qur’an dictionaries such as Mufradaat by Al-Isfahani and selected texts on the classical genre of Uluum alQuran such as the work by al-Suyuti and the specialist work by Al-Tufi on the styles of argumentation in the Quran. In addition, some modern approaches to the Quran such as Fazlur Rahman’s method of ‘Double Hermeneutics’ and T. Izutsu’s linguistic study of the ‘Religio-Ethical’ concepts in the Quran will be examined. . The day seminar will start with a brief discussion about the general features of the Qur’anic discourse, its composition structure and thematic organisation. The reception of the Qur’an within the Muslim tradition will be addressed by exploring diverse scholarly genres within the classical Islamic science i.e Ulum al Qur’an, Tafsir and Usul al –Fiqh. The rest of the seminar will focus on discerning the principles and patterns of educational and pedagogic hermeneutics within the Qur’an and their implications for the theory and practice of contemporary Islamic education. Dr. Sahin, educated at the Universities of Ankara and Birmingham, comes from an Islamic and Educational Studies background and is interested in exploring diverse issues informing learning and teaching of Islam in mainly secular, culturally and religiously plural contemporary societies in Europe. 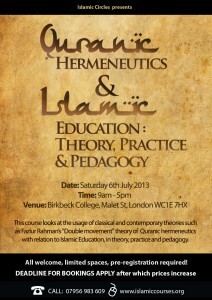 Developing critical /empirical perspectives for the contemporary theory and practice of Islamic Education has been at the centre of his teaching and research activities. “Islam, Secularity and Culture of Critical Openness: A Muslim Theological Reflection” in Y. Birt et al (eds) British Secularism and Religion (2011), Kube “The Complex Inheritance of the First Generation: Religious Nurture Among British Muslim Communities” in OASIS, 2011 V 6 No 12 p.45-50 “The Contribution of Religious Education to Social and Community Cohesion: An Islamic Educational Perspective” in RE and Social and Community Cohesion M. Grimmitt (ed) ( 2010), McCrimmion press, pp.165- 184 “Authority and Autonomy: An Islamic Education Perspective on Human Agency” in Islam and Autonomy; International Perspectives, Marcio Buitelaar et al (eds) University of Groningen, 2011. “Exploring the Religious Life-World and Attitudes toward Islam among British Muslim Adolescents” in L. Francis et al (eds) (2005) Religion, Education and Adolescence: International Empirical Perspectives, Cardiff, University of Wales Press. Pp.164-184. “Sahin-Francis Scale of Attitudes towards Islam” in Muslim Education Quarterly, Spring 2004. “The Profile of Religious Education in the Islamic World, in RE in Europe, Comenius-Institut, Muenster, 2001. “Technologies of self” and perceptions of Woman in Islamic Culture, Islamiyat, 3 (2) p.20-31, 2000. “Educational and Theological Foundations of Religious Education: A “Dialectical/Hermeneutical Approach to the Theory and Practice of Education in Islam”, Islamiyat, 1(2), p.50-75,1998.